View of Mr Egginton’s House in Soho, Birmingham. 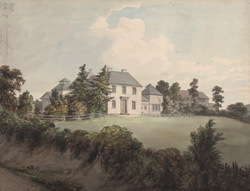 Unfortunately the house in this print can not be identified. Soho is an area of North West Birmingham, that until 1911 was part of the Handsworth District. The name Soho is an abbreviation of South House which referred to its location south of Handsworth. This is a typical example of an item from the King George III Topographical Collection. The King was fascinated with the landscape and geography of Britain and collected maps, atlases and prints as well as original watercolour drawings of various locations around the British Isles.